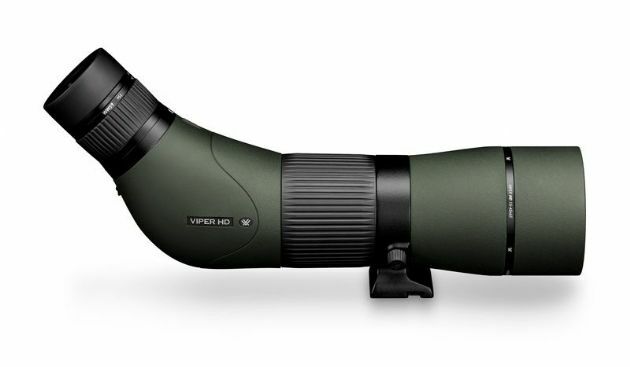 A high-end spotting 'scope without the high-end price tag, the new-for-2018 Viper® HD Spotting Scope series offers highly competitive features and food for thought when choosing a new scope within its price bracket. Packed with features and incredible optical performance thanks to, but not limited to HD glass, XR Lens coatings, Dielectric prism coatings and Armortek external lens protection, these 'scopes bring far off subjects in for you to take a closer look – and do so with impressive clarity, resolution and colour fidelity. The smooth and sleek helical focus allows you to focus on your subject quickly and smoothly for ultra sharp viewing as well as keeping its profile slim for easy storage. Argon gas purging offers superior internal waterproofing and fogproofing and the all-over rubber armouring protects the exterior of your scope. Add to that the included stay-on Neoprene cover and you have one very highly specified all-in-one scope package! HD Lens Elements Optimized optical system delivers impressive resolution, cuts chromatic aberration and provides excellent colour fidelity, edge-to-edge sharpness and light transmission - resulting in High Definition views. XR Lens Coatings Vortex proprietary coatings increase light transmission with multiple anti-reflective coatings on all air-to-glass surfaces. Adjustable Eyecup Twists up and down to precise 'click-stop' settings for comfortable viewing with or without spectacles. Helical / Barrel Focus New Dual geared focus system allows for fast yet precise adjustments. Rotating Tripod Collar Allows rotation of the eyepiece to a sideways position—most useful for viewing through an angled spotting scope body on a car window mount.